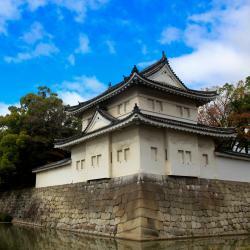 Looking for hotels near Shoren-in Temple? Located a minute's walk from Chion-in Temple, Kyoto Inn Gion offers accommodations in the Gion district. Yasaka Shrine is just a 5-minute walk, while Kiyomizu-dera Temple is a 20-minute walk away. Located just a 5-minute walk from Keage Station, Kyoto Higashiyama offers an eco-friendly accommodations. A 5-minute walk from Higashiyama Subway Station, Guest House Ga-Jyun features free Wi-Fi at the entire property. Only a 3-minute walk from Higashiyama Subway Station, Oki’s Inn offers affordable Japanese-style rooms. A 5-minute walk from Gion-Shijo Station, Yasaka Shrine and Chion-In Temple will bring you to Jeugiya, a Japanese-style holiday home located in a quiet residential area of central Kyoto. Opened in April 2017, Solaria Nishitetsu Hotel Kyoto Premier is set in Kyoto, a 2-minute walk from Sanjo Station on the Keihan Line. A lovely nice, clean, modern hotel. Hotel Gracery Kyoto Sanjo is located a 7-minute walk from Sanjo Train Station and a 13-minute drive from JR Kyoto Station. It offers elegant accommodations with free WiFi access and concierge service.... Perfect place to stay, lots of restaurants in neighbourhood. 2297 feet from Samurai Kembu Kyoto, Cross Hotel Kyoto is set in Kyoto and provides rooms with free WiFi. Located in the Nakagyo Ward district, the property provides guests with access to a restaurant.... Prime and convenient location. Located in Kyoto, a 15-minute walk from Samurai Kembu Kyoto, My K House has rooms with free WiFi access. Located conveniently in the Shimogyo Ward district, this hotel provides a bar. Perfect location, super friendly staff, big rooms, lovely decor and beautiful balconies. Awarded two pavilions by the Michelin Guide 2019, Hotel Alza Kyoto is located near the Kamo River and within Gion District, a 2-minute walk from Sanjo Station. everything about this hotel is awesome! 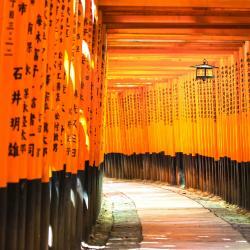 Hotel Ethnography - Gion Shinmonzen is located in Kyoto, a 7-minute walk from Samurai Kembu Kyoto. Love the design and comfort of the room. Located a few steps from Samurai Kembu Kyoto, Gozan Hotel & Serviced Apartment Higashiyama Sanjo in Kyoto provides modern machiya-themed rooms with air conditioning and free WiFi throughout the... Enjoyed the small garden planting outside our tatami room. Located a minute's walk from Chion-in Temple, Kyoto Inn Gion offers accommodations in the Gion district. Yasaka Shrine is just a 5-minute walk, while Kiyomizu-dera Temple is a 20-minute walk away. Super kind staff, very helpful. Great room and excellent location! Highly recommended when in Kyoto. Open from September 2017, The Celestine Kyoto Gion is set in Kyoto, a 10-minute walk from Gion-Shijo Station. 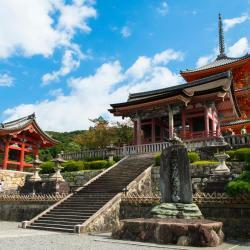 Guests can walk to Kiyomizu-dera Temple in 15 minutes from the property. Clean, modern, convenient to Gion, good service and stylish Japanese design. Kikue Hotel Kyoto is located in Kyoto, 0.8 mi from Kiyomizu-dera Temple. The front desk offers a concierge service. Kiyomizu-Gojo Station 4th Exit is a 5-minute stroll from this property. Kikue Hotel Kyoto is a small boutique hotel just next to Gion Miyagawa-cho geisha district. Hotels with great access to Shoren-in Temple! Kyoto Takakura Hotel Grandereverie has air-conditioned rooms in Kyoto. Excellent customer service! The staff were very professional, helpful, sincere and friendly. 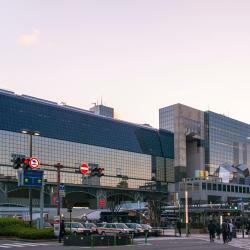 Attractively set in the Nakagyo Ward district of Kyoto, NEST AT NISHIKI, KYOTO is located a 10-minute walk from Kyoto International Manga Museum, 1.1 miles from Samurai Kembu Kyoto and 1.6 miles from... Excellent extremely helpful and qualified staff. Amazing location and super comfortable rooms. Open from February 2015, Aoi Hotel Kyoto is located a 5-minute walk from Kawaramachi Station and a 13-minute walk from Yasaka Shrine. It offers simply furnished rooms and free WiFi access. We stayed at the apartmenr 301 with beautifull balcony with river view. Opened in February 2014, this luxury 5-star hotel features high-standard services and guestrooms that are among the most spacious in Kyoto. The design of this hotel is just magnificent. Located within a 7-minute walk of Kiyomizu-dera Temple, Terrace Kiyomizu Kyoto in Kyoto has a terrace, as well as free WiFi. Good and convenient onsite parking. Extremely friendly staff. Excellent roof terrace. Located in Kyoto, ENSO ANGO TOMI Ⅱ is 1.1 miles from Sanjusangen-do Temple and provides facilities like fitness center, garden and shared lounge. Great size room very modern and very clean.